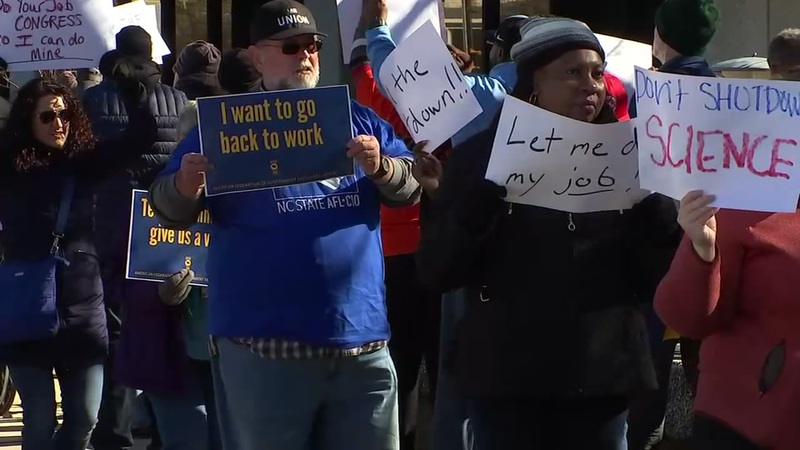 RALEIGH, N.C. (WTVD) -- The effects of the ongoing federal government shutdown aren't obvious when you visit Raleigh Durham International the day after essential workers were not paid. Maya Lewis, an international traveler whose safe journey depends upon the work of air traffic controllers, minced no words when asked if she's aware of the issue. "The people who are working here are not getting paid. I think it's ridiculous. I think regular people shouldn't be wrapped up in petty politics," Lewis said. ABC11 spoke earlier with Nick Stott, the local president of the National Air Traffic Controllers Association, about the effects of the shutdown and missing a paycheck. "We're having very tough conversations with our family, with our spouses, our significant others," said Stott. "And the questions are, how are we gonna pay our mortgages this month? How are we gonna pay our child care bills? How are we gonna pay our utilities?" Manuel Alvarado, a man ABC11 met after he drove a relative to the airport, supports those essential workers. "They all need to be getting paid. You work, you need to get paid. That's how my family's always been," he said. Stott wants people monitoring the shutdown to know that while the air traffic controllers hope for back pay when the shutdown ends, furloughed support staff at RDU and other airports don't have that option. "The people that aren't allowed to come to work because they're deemed non-essential...they don't know if they're going to get paid," Stott said. "The stress level for them must be even higher. Are they gonna be able to pay their bills?" For now, President Trump insists there will be no deal if Congress does not approve the multi-billion dollar demand for money to secure the Mexico border with a physical barrier. "I know Trump, he's trying to get the money for the wall. But I believe that if he sees there's no results coming in, I feel like he should open it up again," Alvarado said.